While processing gift books this morning I came to These 40 Years, The Best of Four Decades in One Pulpit, written by long-time Middle Tennessee minister Paul Rogers. ‘Produced for the moment, consumed, then cast aside.’ So said Claude Spencer, bibliophile and archivist-extraordinaire of the Restoration Movement. Spencer had in mind the ephemeral…advertising cards like the one below, leaflets, bulletins, Sunday School lessons. I think of Spencer each time I run across something so fragile. I wonder which researcher will find in it a small piece of their puzzle. What a wonderful experience it is to connect a researcher with the materials necessary for their project. What a wonderful experience indeed to connect users with their past…where seemingly insignificant ephemeral, momentary items like these can open doors of understanding, reflection, even inspiration. 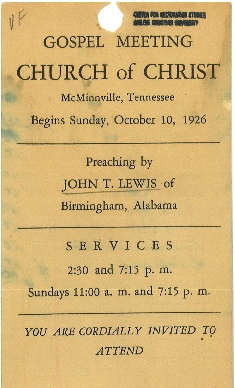 Below: Postcard sized advertisement for John T. Lewis’ preaching at McMinnville, Tennessee, October 1926. From this card we learn that Lewis preached twice daily. Gospel Meetings in this era could last two or three weeks or longer and often resulted in dozens of baptisms and additions to the local congregation.